No sooner had I waved goodbye to the joyous time we’d had at the BBQ the day before, the next morning arrived and it was time to have my PICC line fitted. A peripherally inserted central catheter is a long, thin, hollow tube that goes into a vein above the bend of the elbow and stays in place until treatment is complete. Chemotherapy infusions, antibiotics and intravenous fluids are given through it and blood samples for tests are also taken from it. My Oncologist recommended I have a PICC line as the FEC chemotherapy drugs I would be having can damage veins and become very painful. I don’t have a problem with needles or injections, but I figured I’d rather put up with having the line in all the time than having to deal with any more distress or discomfort than was necessary. My Mum and Dad kindly took me to the hospital that day for the appointment. I was slightly tired, and in all honesty, a little hungover from overindulging the day before. It was like the last supper for me. After everyone had finally left ours, Pats and I stayed up drinking a mojito or two and spent our last “chemo-free” evening together laughing, being silly and dancing around the kitchen. On reflection, come the following morning when I felt slightly fuzzy, I didn’t think it was one of my better ideas to have that last mojito, but what we heck, we enjoyed it right up to the end! I didn’t want to go into the hospital room by myself to have it done so I asked the nurse if my Mum could come in with me. Yes, I’m approaching 40 years old but still need my dear Mum! This was the first time she’d been with me at any of my hospital appointments, so whilst I was really glad she was there, I worried about how she’d feel being exposed to everything that I’d already had a period of time to adjust to. There were three nurses in the room and they explained the procedure and what was going to happen and also went through the potential risks. I signed the consent form and got on to the hospital bed and laid there like a rigid stiff board! I was given a local anaesthetic to numb the area on my arm before they started. I didn’t realise at the beginning of the appointment that the lady who was going to put my line in was actually being supervised by the other nurse. I started to feel really nervous – I know they need to learn by practicing on people but it made me feel so anxious as she was explaining what to do! There was an amazing nurse there called Sarah, she had blonde hair which was plaited in two pig tails and she sat chatting away to me to distract me from what was going on. When I have donated blood or had injections, I’m not really keen on seeing the needle go in or look at what’s going on, so I turned my head to the opposite side and focused on Sarah. She said I looked terrified (no sh1t!) and tried to relax me. As I looked at my Mum’s worried face I then started to feel really bad for asking her to come in with me. From where she was stood, she had a bird’s eye view of what they were doing. This couldn’t have been very nice for her and not exactly what you want to see happening to your daughter. They moved an ultrasound over my arm (it had to be done on my right arm due to having had surgery on the left) so they could find the best vein to use. I could see on the machine to my left an image of what the vein looked like (an oblong shape on the screen!). Apparently it wasn’t that long ago, before they had the technology at the hospital, that they used to perform this without the ultrasound which absolutely amazed me. It meant that a doctor had to carry out the procedure whereas now the specialist trained nurses were able to do it. 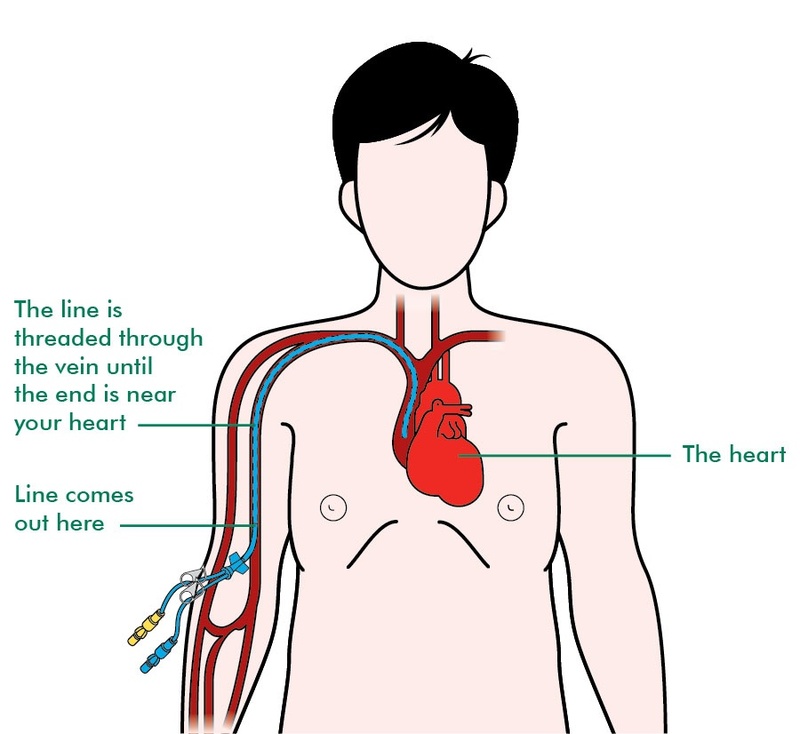 They basically put a needle into the vein and the PICC line is then threaded through the needle, into a large vein that leads to the heart. I didn’t feel any pain at all, I could just feel a little tugging and prodding sensation. I think the thought of what was happening was worse than it actually was! My Mum put her hand on me to comfort me, whilst I gripped onto Sarah’s hand tightly as they gently threaded the line along the vein in my arm until it was in place. When it was all done, I looked down to see this wire protruding from my arm. It felt really weird and very alien-like. Well this is going to me for the next few months then! I’m not allowed to get the line wet or submerse my arm in water and the nurses explained that I’d be able to get a plastic arm protector to use in the shower. Lovely! 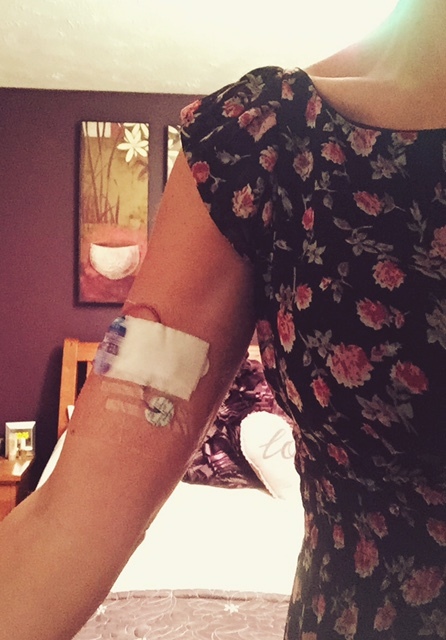 The PICC line is covered by a dressing which needs to be changed every week. When the line isn’t being used, there is a slight risk of it becoming blocked. To prevent this from happening, I would need the line flushed with a small amount of fluid using a syringe. I’d have to go to the hospital each week to have this done or they can teach your partner/carer to do the flushing/re-dressing over two training sessions. Although Pats had already said he’d wanted to do this for me, whilst I didn’t relish having to go back to the hospital every week, I felt it would be one thing less he’d have to worry about so I said I’d prefer to go to the hospital. We located my Dad, who had been patiently sitting in the waiting room and went up for a chest x-ray. They confirmed that the line was successfully in the correct position and we were free to go. There we were in the middle of summer and I now had a constant bandage around my arm, completing the cancer look nicely. After getting the funny shaped plastic covering from the chemist to use in the shower, I decidedly instantly that I wasn’t going to use it. It’s actually meant for people with a plaster cast and I didn’t trust it fully to not get my arm wet in the shower. So baths in the morning is now how my routine goes, waving “Pixie” and my right hand in the air so as not to get it wet. Oh how I long to be able to completely submerge myself in a deep vat of water or stand in a shower and feel the water sprinkling all over me. Having successfully gained the all clear from the re-excision surgery, Pats and I were determined to get away on holiday before my chemotherapy was due to start. Our gorgeous friend, Kate, managed to find us a holiday and we jetted off for a week in the sunshine. 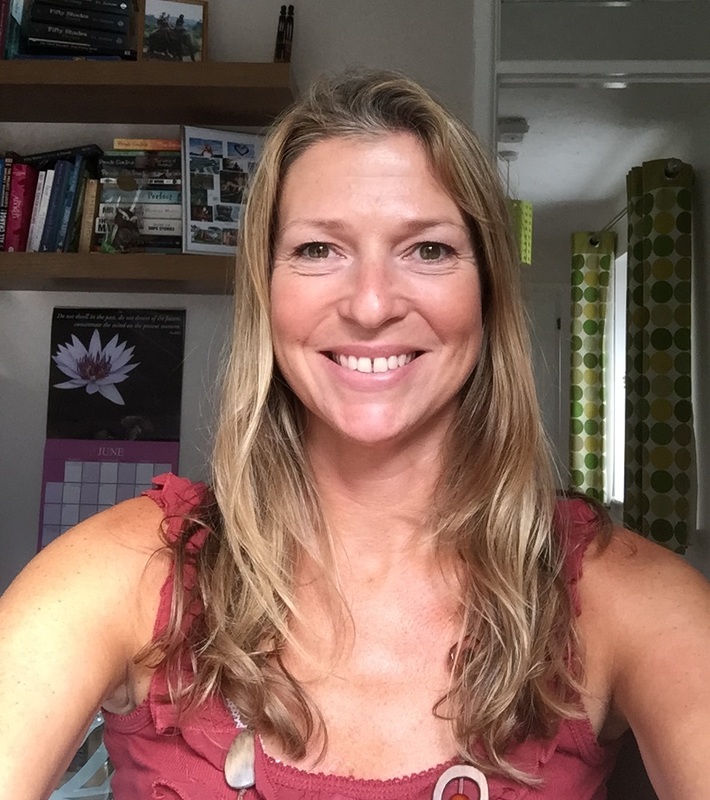 It was so lovely to escape from everything – no hospitals, no appointments and I actually felt ‘normal’ again for a week. I really didn’t want to come home from that holiday as I knew what was in store for me when I got back. When we got home a letter had already arrived in the post with the scheduled dates to have my PICC line fitted and when the first chemotherapy treatment would start. Crash bang wallop – right back down to reality with a big bump. I felt very tearful after reading that letter – you know it’s all going to happen but at some points things just seem more real than others. The time in between getting back from holiday and waiting for the first chemo session was so weird. As well as feeling really anxious and apprehensive about what was in store for me, I felt like I needed to have a final get together with my friends and family. It was almost like I needed to have a chance to say goodbye to the old me as I really didn’t know who I was going to become in the coming months. Luckily my best friend, Tara, was home from Scotland for a couple of weeks and we were able to spend some quality time together. It was such great timing and the best medicine. She has been one of many who have been there for me throughout all of this. She has been so supportive, always sending me thoughtful cards with encouraging words and texting me before and after I had appointments to make sure I am okay. We don’t get to see each other often at all, so it was even more amazing to be able to spend time in person with her at such a stressful time. 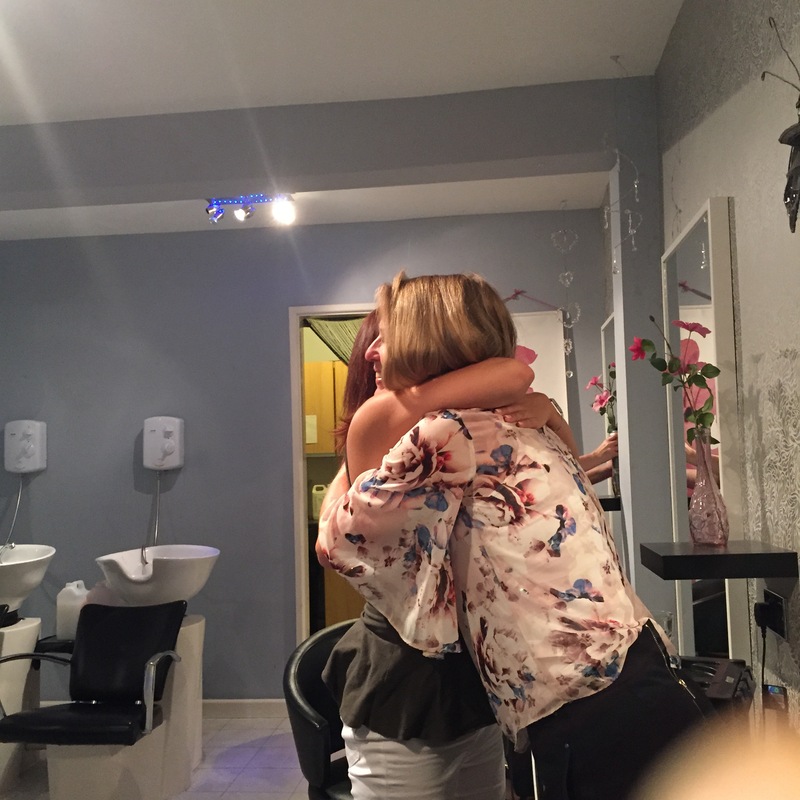 I’d begun the hunt for a wig and she came along to countless wig fittings with me, supporting me, making me laugh and generally making me feel better about myself. We had a bit of a girly get together at my lovely friend Katherine’s house one evening and it was so nice to see all the girls and catch up with them. I also had my hair cut short into a bob to help prepare me for the impending hair loss. 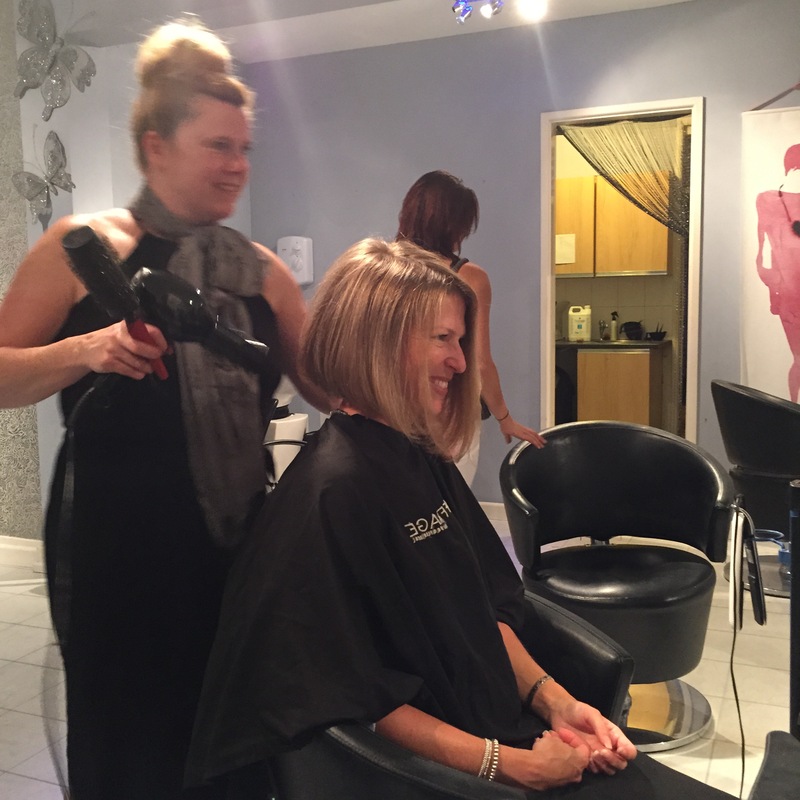 My super sweet friend, Lou, had organised with our hairdresser, the lovely Natalie, to go to her salon (which she had closed especially for the evening) and said I could have anything done to my hair I wanted at no charge. She is so, so kind. Before going to the hairdressers we had a little ‘dutch courage’ in the pub (which was massively needed and a great help!). It was there that Lou told me how she had been fundraising for me at work and with my friends and family to get some money together so I could buy whichever wig I wanted and not have to worry about how much it would cost. I was absolutely moved to tears, not only by her kindness to do such a thing for me, but also for the generosity of my friends, family and colleagues. I was feeling the love big time! 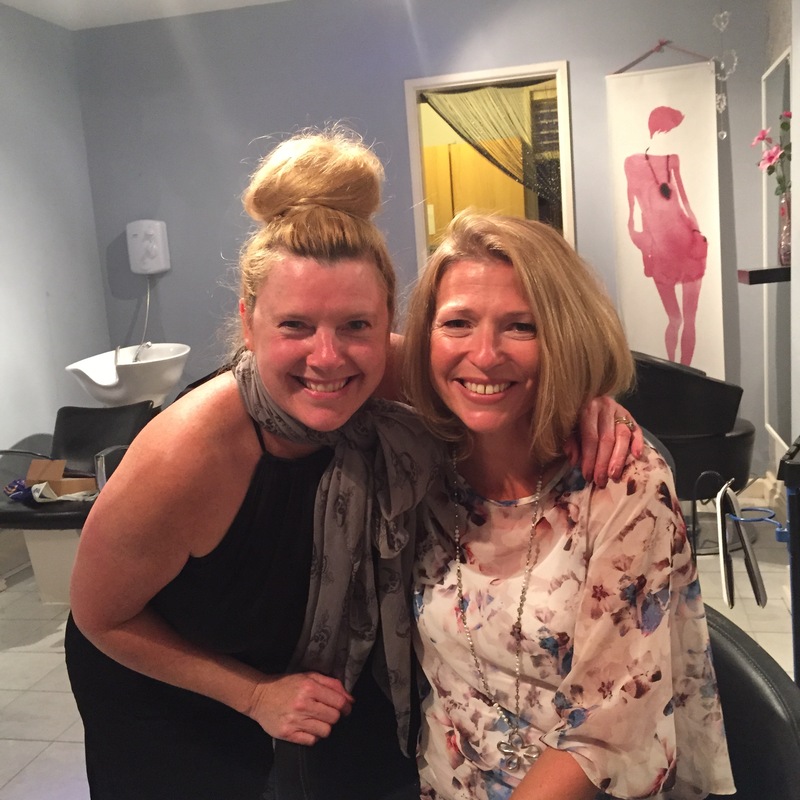 Along with my other beautiful friend Claire, who had presented me with a gorgeous bouquet of sunflowers that evening, we ventured off to Natalie’s salon for the ‘big chop’. As we sipped on some bubbly, I sat in the chair in front of the mirror looking at myself. 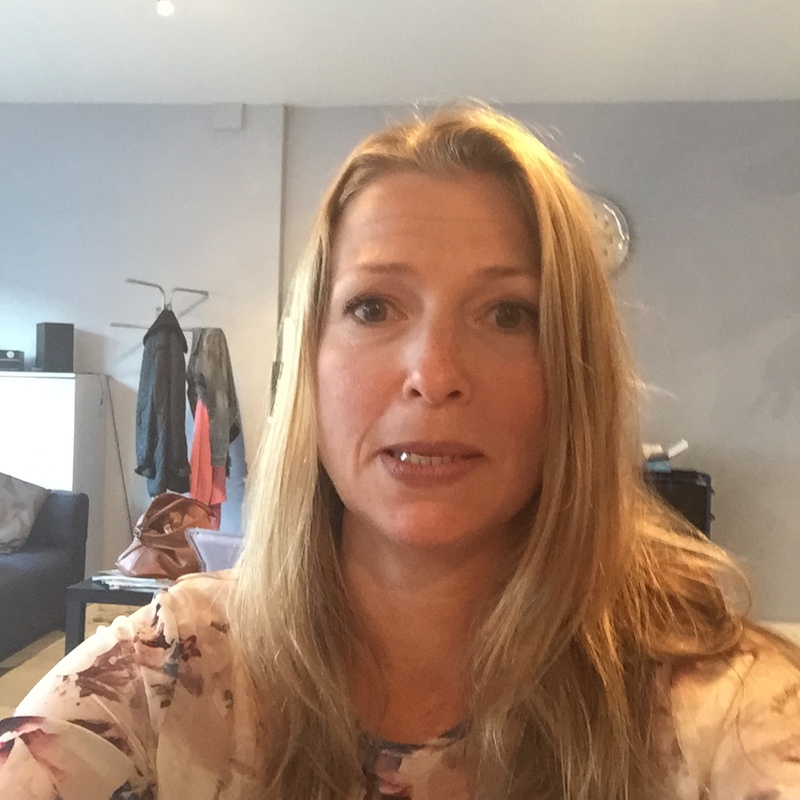 For all the years I’ve been going to Natalie to have my hair done, whenever she asks ‘what are we doing today then Allie?’, unsurprisingly to her I always reply ‘oooh, just a smidgen off the ends please Natalie and the usual colour’. Well holy cow, today was completely different not only for me but for her too! As suggested by Tara, Natalie cut a lock of my hair off so I could keep it to use when looking to match it to a wig. 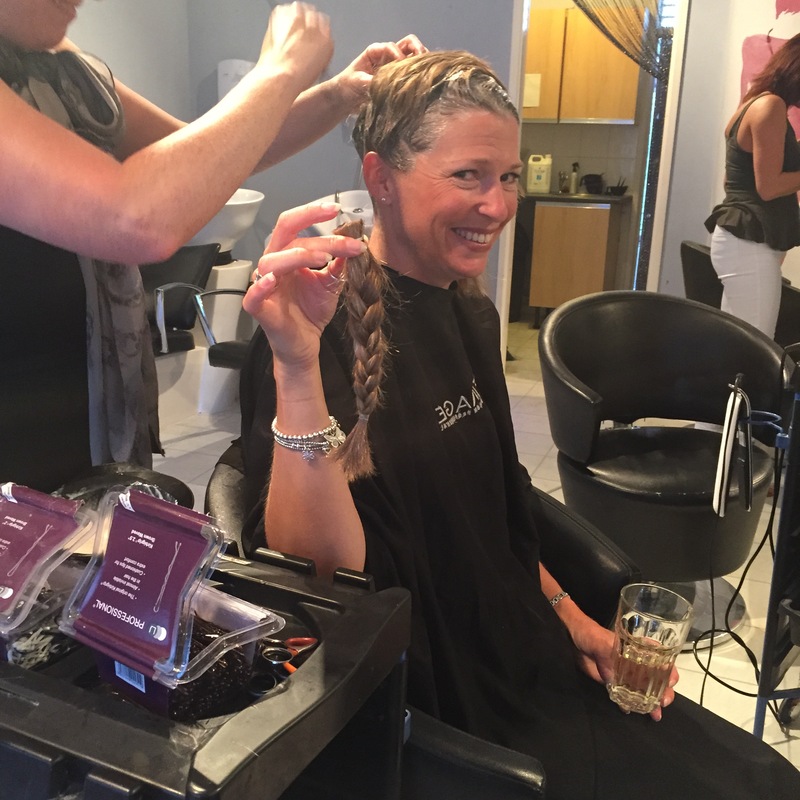 I wanted to donate my hair to charity so she put my hair in a ponytail and plaited it and after tying it with a hair band – she cut it off! Oh my god…..wowsers! Except for one occasion when I was about 12 and had my hair cut really short, I’ve always, always had long, shoulder length hair, and have never really like tying it up or away from my face. 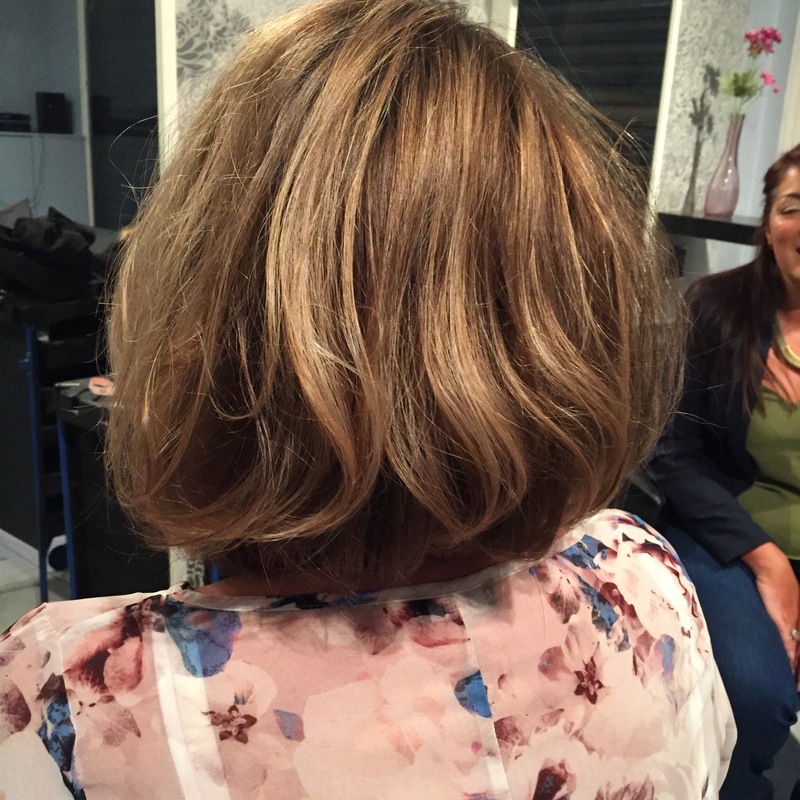 Now I had a bob… and a neck which you could see! It actually felt quite liberating in a way. Natalie blow dried it and made it look amazing. She was so kind to donate her time and she wouldn’t accept any money from me. 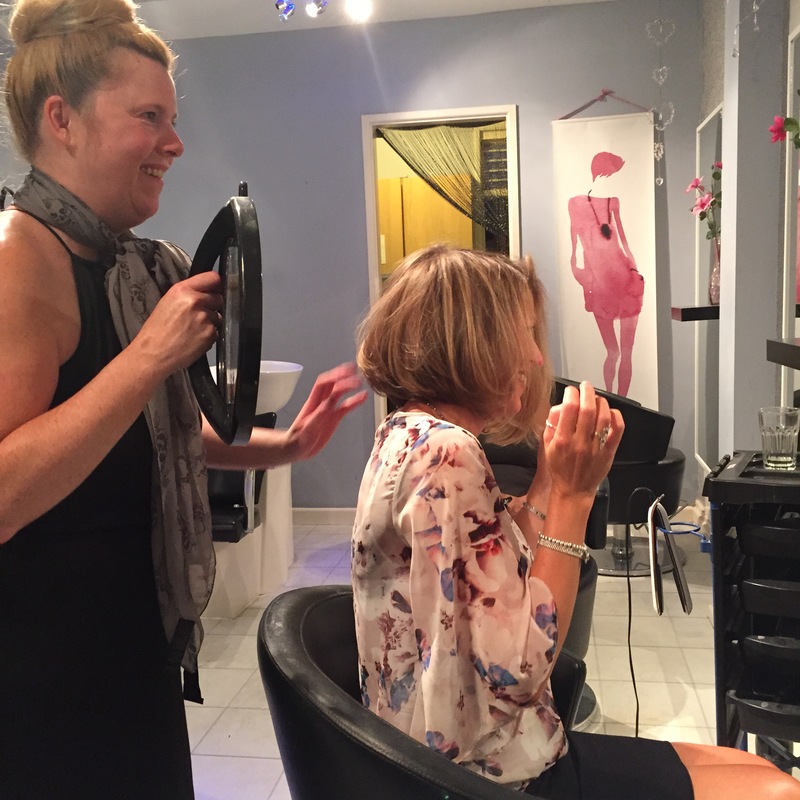 As we left the salon I couldn’t help swishing my hair about, I felt like a lady in one of those hair adverts and Lou, Claire and I walked along singing “It’s like you just stepped out of a salon.. Salon Selectives” (only the slightly older readers will remember Salon Selectives hair products!). We went to a birthday BBQ on the Saturday and had a lovely time catching up with friends and on the Sunday we hosted a BBQ at our house with my parents, my sis, Tara and two of her gorgeous children. It had been quite a whirlwind and hectic week but it was just the best getting to catch up with all my nearest and dearest. By the time I’d come down from the high of seeing everyone, once again back to earth again with a bump knowing that on Tuesday I would be having my first chemo treatment. I felt very mixed feelings waiting to start chemo, I wanted to get it over and done with so it’s done its thing, but equally I didn’t want it start as I just didn’t know what will be in store. I was absolutely petrified of how I was going to feel, what was going to happen to me, how I was going to look and what sort of person I was going to turn into.